Experience the Old World elegance in a tropical paradise within a few minutes walk of the Gulf of Mexico. This 4 bedroom, 3-1/2 bath home boasts upscale furnishings and great views of the lagoon style pool. This is it! The home you’ve been searching for! Welcome to your vacation at Tuscan Charm. 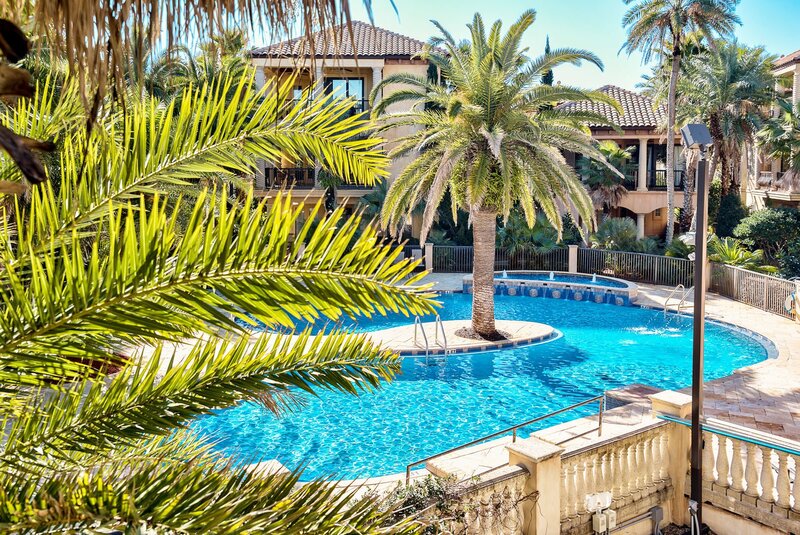 You’ll delight in the Old World sophistication and charm of this 4 bedroom Mediterranean villa situated in a small, gated enclave with spectacular tropical paradise surroundings and cobblestone streets. – Queen bedroom with en suite bath. Each bedroom has a flat screen TV for your entertainment. – The main living area features a 70” flat screen HDTV and DVD player and an all glass wall along the south side has sliding glass doors that open at the corner to bring in the lush tropical paradise just outside. You’ll delight in the balcony right off the living room as the perfect place for entertaining. Convenient seating for 6 and a gas grill round out the balcony. 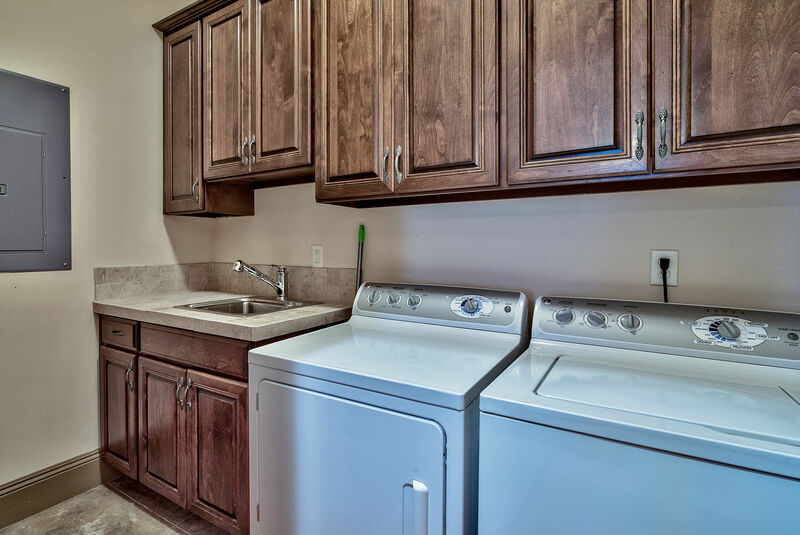 – The fully stocked kitchen offers a Décor countertop stove, oven, and microwave, Bosch dishwasher, and Sub Zero refrigeration, as well as plenty of pots, pans, and kitchen utensils. – The master suite features a King pedestal bed with drawers. An en suite master bath invites you to relax in the Jacuzzi tub and large walk-in shower after a day at the beach. This tranquil enclave offers a tropical paradise with lush foliage everywhere. The 2000 sq. 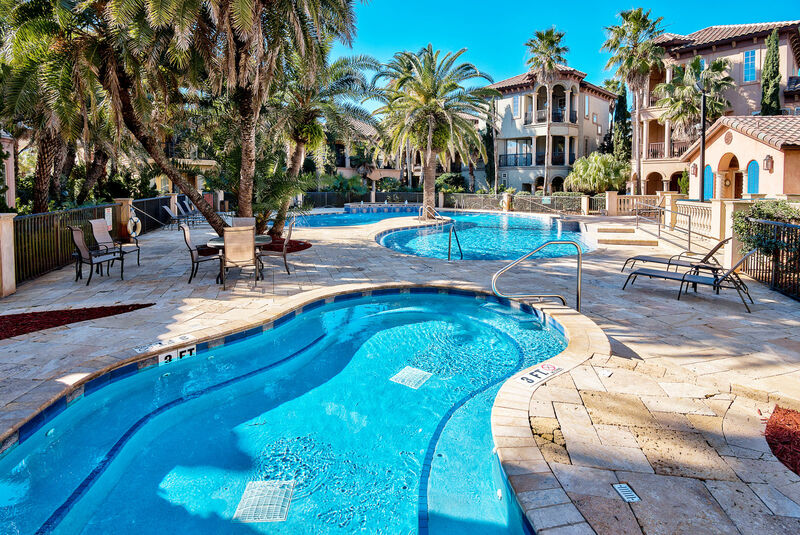 ft. lagoon-style pool features sparkling fountains, an outdoor shower, bath house, tanning deck, furnished lounging area, and a large hot tub (heated year round). 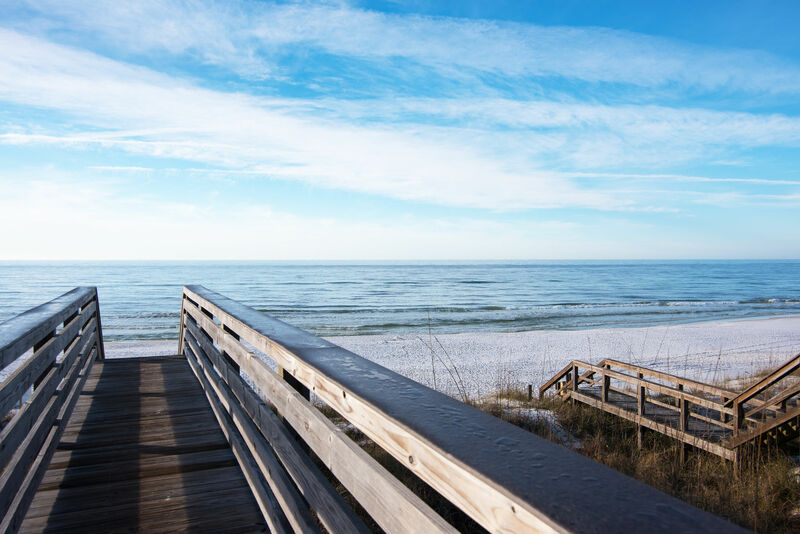 The private, gated beach access is just a block away from the neighborhood – a 3-minute easy walk. 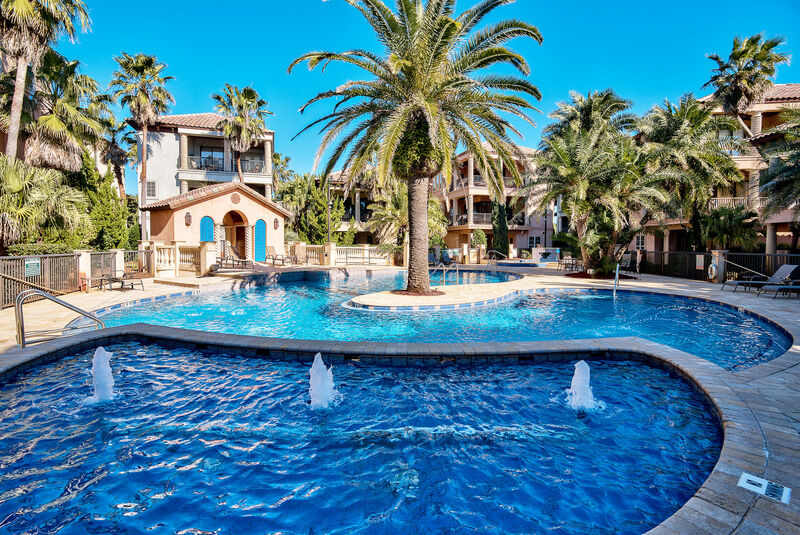 St. Tropez is located within walking distance of many restaurants, including the Surf Hut and Buster’s, a grocery store (Winn-Dixie), Silver Sands Designer Outlet Center, and only minutes from water sports, fishing, several golf courses, and other family attractions. 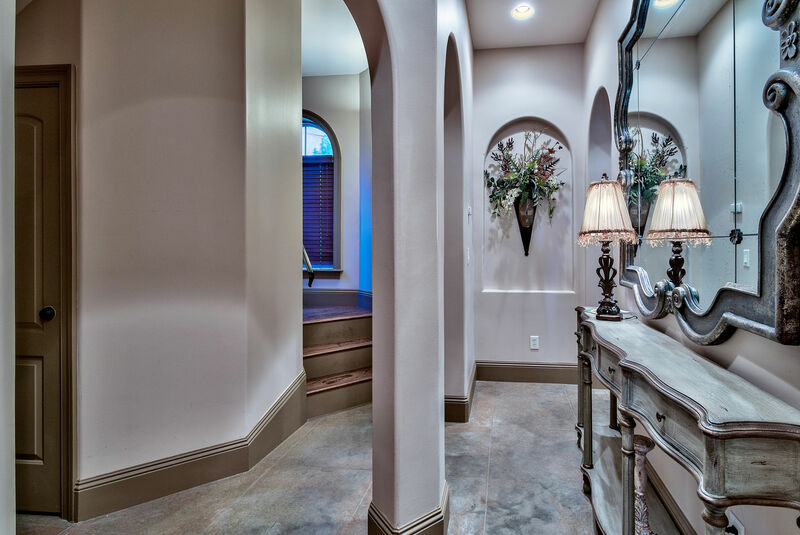 Tuscan Charm is in pristine condition and furnished with upscale décor. We rent to responsible families and professionals who are a minimum of 25 years of age WHO WILL RESPECT AND CARE for our home by leaving it in the same condition in which it was found upon arrival. This home is not equipped to accommodate high school or college groups, weddings, or receptions. Maximum occupancy is 11 people regardless of age.